This adorable bunny is ready to hop into your heart! 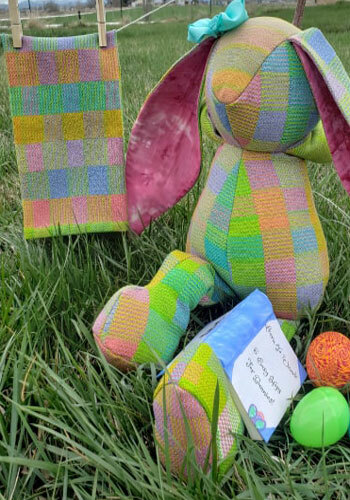 Spring has arrived and the spring-time combination of green grass, colorful eggs and bunnies inspired us to make fabric and towels to match the season! Instructions for the towels and our own pattern for the bunny is included. Choose your favorite from 3 combinations of kits or just the pattern! April the Bunny Only–Comes with all the yarn and instructions to make enough fabric for a bunny. Also includes the pattern to make the bunny. Two Towels Only–This kit comes with enough yarn and instructions to make 2 towels (approximately 17” X 24” (hemmed). April the Bunny Pattern–Pattern to make the bunny. No yarn included. Will arrive by USPS mail. April and these dishtowels are only available for a limited time! She’s a Springtime gal only! The bunny was inspired and helped into existence by Kathleen Waln and the Southern California Handweaver’s Guild. Hey there!, I found this information on Lunatic Fringe Yarns for you: "Hoppy Spring – Bunny and Towels". Here is the website link: https://lunaticfringeyarns.com/product/hoppy-spring-bunny-and-towels/. Thank you.